Last week we wrote about a candle in the dark for Copenhagen traffic priorities. The light, however, was blown out in a local storm, it seems. Friday last week the politicians at Copenhagen City Hall - led by a Social Democrat majority - declared they had finally reached an agreement on the annual budget. They announced there would be more green mobility to the amount of $15 million USD for improving bicycle mobility, bike racks, etc. That’s the same amount as has been the average for the last five years or so. An amount equal to 1/41th of what the city and the government funnel into investments in better mobility for cars, as we wrote about in a previous piece in this series few weeks back. Basically, nothing new under the sun. Well, as it turns out, the reality is much different. In 2013 there will literally be no new bicycle infrastructure projects set into motion. Only projects which are under construction - or can´t be cancelled without penalities by the end of the year - will be finished in 2013, according to the press secretary of the Lord Mayor's office. If you look through the appendixes to the budget, as we have done, it turns out that the City decided to postpone $14.5 million USD of the 2013 budget to 2014 and even later. Along with $10 million USD worth of projects budgeted in 2010, 2011 and 2012. Every year, the government decides on a ceiling for public investments and services, which the municipalities must operate beneath. The reason Copenhagen is stretched so thin and restricted in its financial maneuveurability is that the City has commitments from previous years for new expressways for cars, new car parking and mini-Metro investments. Non-bicycle infrastructure investments are so massive that, for 2013, there is less than $500,000 USD for new bicycle infrastructure. All the while the City is building a 40% capacity upgrade to the largest in-road to Copenhagen, the North Harbour Tunnel. This road will lead to, among other places, the Nordhavn development. Which was a perfect candidate for a modern, progressive, car-light development on a par with Vauban. Or indeed city areas all over the world. 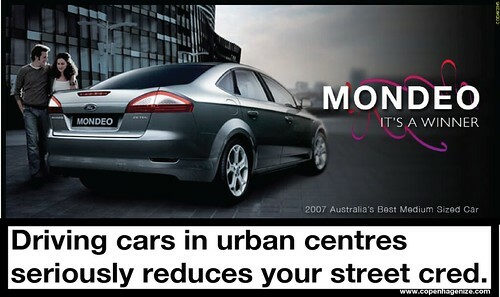 Once again, the car lobby strikes back and the politicians bend over backwards to accommodate it. The mini-Metro, which is the most expensive investment in public transit in the history of Copenhagen, is designed to run in the inner-city on distances which are today travelled by bicycle for more than 80% of trips. Guess who will be travelling in this underground worm when its finished. Cycling rates will fall. You heard it here first. Although many bus passengers will be forced to use the mini-Metro instead because once it starts operating, many bus routes will be closed in order to increase car capacity on inner city roads. They will be desperately needing that capacity, with the North Harbour Tunnel infusing more and more cars into The New Copenhagen.